Jeff Koons: A Retrospective. Whitney Museum of American Art, New York, New York, June 27 - October 19, 2014. Jeff Koons, New Paintings and Sculpture. Gagosian Gallery, New York, New York, May 9 - June 29, 2013. Jeff Koons. Gagosian Gallery, Beverly Hills, California, December 7, 2012 - February 14, 2013. Corbett, Rachel. "Koons at cutting edge with giant stone mills." The Art Newspaper 3 March 2015, illustrated in color. Goldman, Edward. "One Can't Have Too Many Picassos, But Many Jeff Koons is a Problem." Huffington Post 22 September 2015, illustrated in color. Rothkopf, Scott. Jeff Koons: Retrospectiva. Exh. cat., Spain: Fundación Guggenheim Bilbao, 2015 [Texts by Antonio Damasio, Jeffrey Dietch, Isabelle Graw, Achim Hochdörfer, Michelle Kuo, Rachel Kushner, Pamela M. Lee, and Alexander Nagel], pp. 118, p. 258, 262, 282, illustrated in color. Tinari, Philip. Jeff Koons: Hulk Elvis. Gagosian Gallery Hong Kong, Rizzoli International Publications, Inc., 2015, pp. 7, 12, illustrated in color. Budick, Ariella. "Jeff Koons at the Whitney Museum." Financial Times 4 July 2014. Champion, Julie and Nicolas Liucci-Goutnikov. Jeff Koons: La Retrospective: The Portfolio of the Exhibition. Exh. cat., France: Centre Pompidou, 2014, p. 132. Gagosian Gallery. Jeff Koons: New Paintings & Sculpture. Exh. cat., Uckfield, England: Gagosian, 2014, pp. 60-61, 69, 71. Ilnytzky, Ula. "Jeff Koons Retrospective offers 'a perfect storm'." The Globe and Mail, The Associated Press, New York. McGarry, Kevin. "The Facts and Figures Behind Jeff Koons's Massive, Awe-Inspiring Show at the Whitney." T Magazine 2 July 2014. Moderna Museet. Sculpture After Sculpture: Fritsch/Koons/Ray. Exh. cat., Ostfildern: Hatje Cantz, 2014 [Texts by Jack Bankowsky, Thomas E. Crow, Nicholas Cullinan, Made Great, conversation between Michael Fried, Isabelle Graw, Michelle Kuo, Charles Ray, Scott Rothkopf], p. 110. Rothkopf, Scott. Jeff Koons: A Retrospective. Exh. cat., Greenwich, Connecticut: Whitney Museum of American Art, 2014 [Texts by Antonio Damasio, Jeffrey Dietch, Isabelle Graw, Achim Hochdörfer, Michelle Kuo, Rachel Kushner, Pamela M. Lee, and Alexander Nagel] pl. 117, p. 289 (illustrated in color). Rothkopf, Scott [supervised by Bernard Blistène]. Jeff Koons: La Retrospective. Exh. cat., France: Centre Pompidou, 2014 [Texts by Bernard Blistène, Antonio Damasio, Jeffrey Dietch, Isabelle Graw, Achim Hochdörfer, Michelle Kuo, Rachel Kushner, Pamela M. Lee, and Alexander Nagel] pl. 117, pp. 194, 262, 263, 283, illustrated in color. Salmon, Felix. "Jeff Koons: A Master Innovator Turning Money into Art." The Guardian 3 July 2014, illustrated in color. Vogel, Carol. “Think Big. Build Big. Sell Big.” The New York Times 11 June 2014. Vogel, Carol. "A Jeff Koons Extravaganza Puts the Whitney to the Test." The Australian Financial Review 28 June 2014. Goldman, Edward. "The Artist as Magician and Trickster." Huffington Post 19 March 2013, illustrated in color. Neuhauser, Alan. "5,000-Pound Gorilla Sculpture Makes Gawkers Go Ape in Midtown." DNAinfo 6 November 2013, illustrated in color. Rabinovitch, Simona. "Jeff Koons Debuts New Work at Gagosian Gallery." Gotham Magazine 15 May 2013, illustrated in color (Edition 1). Zwick, Tracy. 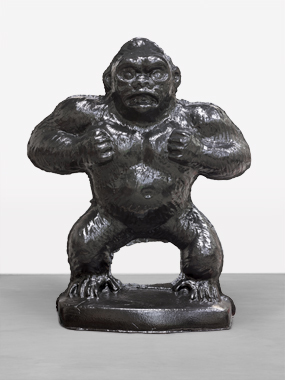 "Double-Barrel Frieze-Week: Jeff Koons at David Zwirner." Art in America 10 May 2013. Vogel, Carol. "Inventing Abstraction at MoMA, Collaboration with WQXR." The New York Times 6 December 2012. Carrozini, Francesco [text by Arturo Zampaglion]. "The Pop Couple. Jeff and Justine Koons." L'Uomo Vogue January 2010, cover, pp. 262-267, illustrated in color (model). “The On Time Artists Portfolio.” Vanity Fair on Time October 2010, p. 83, illustrated in color (model).